Although I prune roses every year, and have for decades, I really don’t know what I’m doing. Yes, I know about outward facing buds, crossing branches, and twiggy growth, but when confronted with an actual rose, those directives feel very abstract. And somewhat useless. So before I make the first cut I think about two things. First, there was the year I didn’t get to the shrub roses at the Glasbern Inn soon enough to suit the owner. He took a chain saw and sheared them at a height of about 18 inches, and you guessed it—they bloomed beautifully that year. The second example came in an article I read a year or two ago, written by a British rose grower (who must have been an excellent gardener because he lived in England). 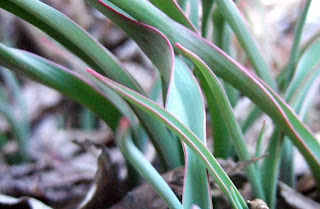 In the article were photos of pruned and unpruned roses side by side. There was absolutely no difference between the two! Armed with the knowledge that pruning roses is not a matter of life or death I put on my rose-colored glasses and make up my own rules. 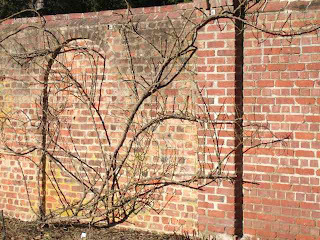 My rule with the vigorous ‘New Dawn’ rose wired to this historic brick wall is, if a lateral branch sticks out too far I cut it back. Horizontals I don’t touch unless they’re sprawling in the wrong direction. As for the dozens of shrub roses at the Glasbern, no one rule applies. Some are in locations that have become shaded over time, so I allow them to reach (through weeping hemlocks or up against stone walls) for the sun. To do otherwise would be cruel. I groom most of my shrub roses (‘Carefree Delight’, a couple of Easy Elegance roses, and a mix of Meidilands) fairly lightly, pruning off last year’s hips and cutting long canes back to two to three feet. I leave the cascading roses that drape down from a height of 15-20 feet toward the Glasbern parking lot below completely alone. For one thing, I would need a crane (and some really tough gloves) to prune them safely, and for another, I want them to eventually coat the entire bank with luxurious pink blooms. At that point I may rethink my non-strategy. Without fail, all of the roses reward my fumbling attempts at grooming them with an exuberant show. This, by the way, was the perfect week to prune roses. I only went out to cut some forsythia. 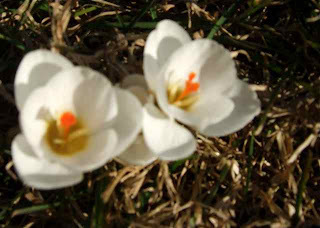 But the sweet little white crocuses that opened up this morning were such a welcome sight that I had to photograph them. And then there I was on my knees worshipping the spinach as it peeped out from under its bed of straw and admiring the strappy foliage of Tulipa clusiana that was curling around under the hydrangea … which called to me as I passed and insisted that I cut off the scruffy remains of last year’s flowers. Garlic greens were poking through the soil (yes!) and Jackmanii clematis was tangled all through my sweet Carol Mackie, a situation I could not just pass by without correcting. Gray-white Nepeta foliage demanded to be set free of last year’s brittle remains, and that old spiraea stump yielded (finally) to my not-so-gentle pushing and broke off at its rotten base. It takes, you might or might not be interested to know, three years for a decades-old Spiraea x vanhouttei to mostly disappear after it’s cut off at ground level. 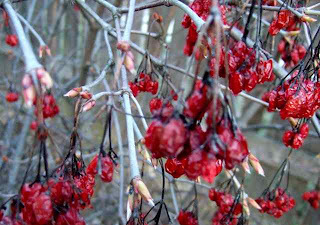 Viburnum setigerum berries are still hanging juicily aside pregnant leaf buds, fermenting. Maybe the birds that have eschewed them all winter will now begin to find them fascinating. Piles of snow still rest in shady corners, and the soil is too cold to sprout much besides bittercress, onion grass, and last year’s larkspur seedlings. It is not spring yet. But the sun is shining and the view, though short in stature, is tall in promise.